Realised it was a while ago I made something creepy so I threw together this star vampire watching the last episode of Game if Thrones. She looks extremely top heavy from the front but that is, at least partially, a trick of perspective. Looks like she works out too. Good. Skinny warriors are ludicrous anyhow. 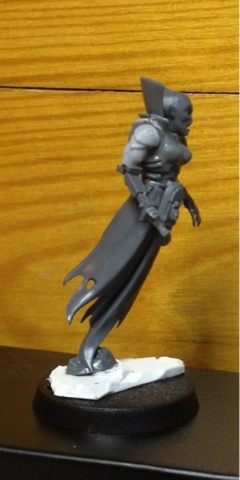 Good start, but she seems to need some hips and maybe a bit more length in the torso. Very strange model, but not in bad way. She's received a new cybernetic arm and some bling - I'll post some new pics soon!